It would be remiss of me not to talk about the ‘title decider’ and although it predictably lacked the wild flair and thrills to match the hype, it nonetheless conjured up some neat points. 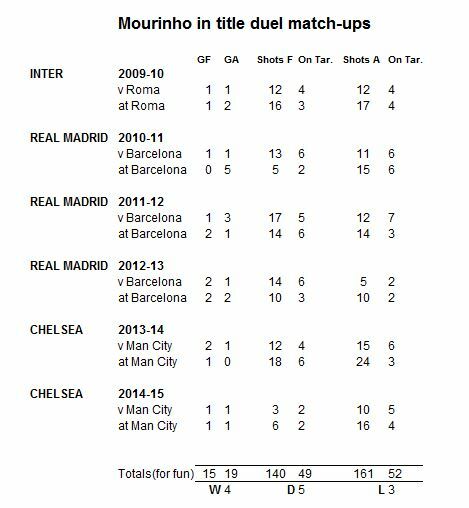 Last year, Mourinho was quite fond of reflecting that his side had beaten the two teams above them in the table in all their fixtures and whilst this year he remains undefeated against both Man City and Liverpool, no bragging rights were derived from his team’s tepid display on Saturday evening. In fact, shorn of Fabregas and Costa, he was left with the rarely selected Ramires to add to a proliferation of gritty Brazilians in both team’s midfield and a club hopping ex-Newcastle forward up front: Chelsea’s line-up felt distinctly last season. And their performance was far more reminiscent of that team than the efficient and ruthless unit we’ve witnessed so far this year. On the flip side, having gained just one point from the matches against Arsenal and Chelsea, Pelligrini can feel a little aggrieved. In both matches City went behind having done little wrong and in both matches they had long spells in which they squeezed and squeezed. Unfortunately for them, where in the Arsenal match the 20 minutes of constriction was relieved by Giroud’s goal, it followed that Chelsea managed to retain parity; on another day the pressure may have eventually told. Intriguingly, few were ready to acclaim this as a defensive Mourinho masterclass and his petulant media blank betrayed an intent to bury any in-match storyline and let the maintained 5 point lead drive the headlines. So: three shots is bad. The point gained was good but with no incident to dramatise and his team lacking a praiseworthy hook, it was silence from Jose. It is strange to think of Chelsea as a side that lack depth, especially when reflecting that they have a second squad of talented and promising players out on loan, but when you dine at the very top table, squad depth can be difficult to maintain. When employing some of the world’s best, their replacements will necessarily be a step behind. Chelsea bought the right players in the summer, but their retained fitness is paramount for them to maintain their title challenge. Last season, here on Statsbomb, Ted Knutson noted the ’16 shot principle’ as quick method to identify relegation candidates mid-season (FWIW only Sunderland and nearly QPR are qualifying right now, but shots are down generally). 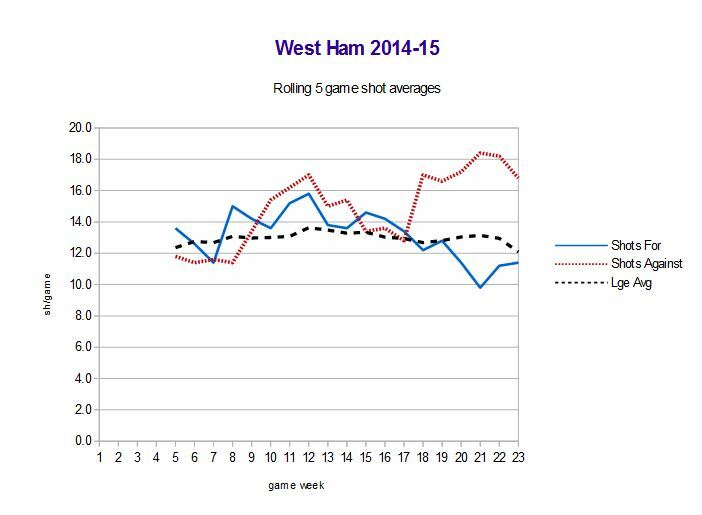 If we refer back to the chart, we can see that West Ham have been heroically exceeding that mark for some while. Combining this with a shots for rate that’s heading for the bin and we can now see that all the early season promise was something of a mirage. So how on earth are they sitting in 8th with all those points? Is the league that bad, or are they just riding some luck? *PDO: essentially the rate in which shots on target are converted added to the rate in which you prevent the opposition converting. Known to regress over time. High is often thought to represent lucky, low= unlucky. Every year there are teams that appear to exceed their talent level and it is often accompanied by a PDO spike. Newcastle’s 2011-12 5th, Villa’s 09-10 6th and Everton last year all ran high PDOs. It can contribute to saving truly bad teams too, Stoke 11-12 put up horrible numbers but survived in 14th and er… West Ham last year? Yep. Relegation numbers from Big Sam last season yet 13th place powered by a big PDO. Does lightening strike twice? 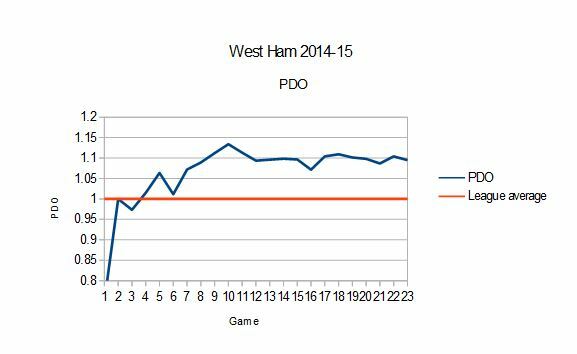 I remain sceptical that Allardyce has found the holy grail of stat-based management (Eternally high PDO!) but it is known that he does incorporate some level of analytical thinking in his preparation. More likely is that these numbers are unsustainable and will come down as the season progresses and West Ham will probably fall back to mid-table. The near future will test them hardily too: visits to Southampton, Tottenham and Arsenal are imminent and they host Man Utd and Chelsea soon. As interest in the numbers of football has increased, we’ve seen a eagerness for news media and television to incorporate statistics to flesh out the storyline of what unfolds. Monday Night Football does an excellent job of putting together a coherent and multi-faceted analysis of the weekend and has been so successful that there are now Liverpool fans that do not detest Gary Neville, a feat thought quite impossible from his playing days. ”First thing a player looks for on a Monday morning, talk about managers being obsessed with stats, players are obsessed with stats! (…) first thing they look for (…) How well have I done? (…) my pass completion and how much distance have I covered and you’re not necessarily having an influence in the game. That’s the problem. One presumes that in-club, post-game analysis has moved on at a similar rate to the external blogosphere since Kilbane exited the Premier League in 2010. However, it’s hard not to be incredulous and mildly disheartened that his and Chapman’s analysis on why stats are ‘ruining football’ is the primary view that millions of fans will have heard tonight.